Analysts at BNP Paribas have written to clients at the start of the new month saying they expect Pound Sterling to advance on the Euro. The call comes after two weeks of weakness for the Euro which saw the EUR/GBP exchange rate fall from £0.8788 in mid-March to £0.8506 at the time of writing. Over the course of the past trading month the Pound has advanced on the Euro by 1.67% confirming momentum remains with Sterling’s and on this basis alone we should favour the UK currency in the short-term to extend gains. 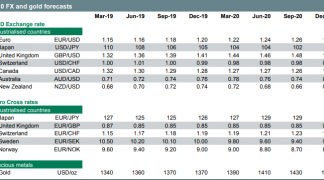 But momentum alone is no reason to expect a rally to continue and BNP Paribas have given three reasons as to why they expect the British Pound to advance on the Euro over the near-term. Brexit news flow should slow down and this will likely aid the Pound over the near-term. Donald Tusk has presented the draft of Brexit guidelines to the EU27 member states but they still need to formally agree the guidelines and further time should elapse while the European Commission defines its strategy. This view is not unique amongst the analyst community and we have reported elsewhere that Sterling might appreciate over coming days and weeks in an expected lull concerning Brexit news. With the Article 50 letter now delivered and Parliament in recess, Brexit focus is likely to shift to the EU Summit at the end of April. Markets remain heavily skewed against the Pound in a one-way directional bet that anticipates more weakness. For an exchange rate to keep moving in a given direction it requires more and more traders to enter that trade. But, what if the majority of the market has already committed to that trade? The move stalls. In fact, the chance of a countermove grows as it doesn’t take much to flush traders out of the market as many will be content to book profit. “We think some of the market's short positions could be squeezed out once Article 50 is triggered and the news flow slows,” says Leonard. BNP Paribas Positioning analysis indicates that GBP remains the largest short position amongst G10 currencies (-35 on a -/+50 scale). Short positions have extended recently and the score is now in line the lows in January 2017, when the market adjusted to the UK government indicating it wouldn't push for single market access after Brexit. The recent increase in short positioning has been mainly driven by a fall in the Fund Position Tracker, which gives an indication of hedge fund positioning. Finally, we could expect Sterling to advance as markets refocus on economic fundamentals. Despite inflation now above the Bank of England’s 2% target (2.3% y/y in February), the market is only pricing in a 40% chance of a BoE hike this year. “Our economists believe UK CPI will reach 2.7% in the year end, the BoE expects inflation to remain above target until at least 2020 and some of the board members have already expressed limited tolerance for inflation overshoot,” says Leonard. As the Brexit news flow slows down, markets should refocus on UK economic fundamentals. The small print here is of course that the data needs to be good! As we have seen from the first data release of the month markets did not react kindly to a miss on the manufacturing PMI figure for March. 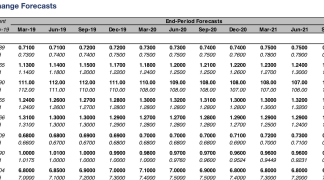 This confirms markets are quite attuned to the economic calendar. Nevertheless, April could be a month characterised by a Pound driven by data as we wait for Brexit negotiations to begin in earnest. 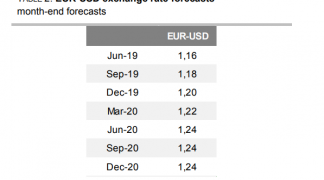 BNP Paribas are forecasting EUR/GBP to fall down towards a target of 0.82 by mid-2017 where it should hover until it falls to 0.80 by the end of the year ahead of a slight improvement to 0.81 by the end of the first quarter of 2018. From a Pound to Euro exchange rate perspective this equates to 1.22 ahead of 1.25 and 1.2346.